My life, under the microscope...: the gallery show! Last night was the artist's reception for the 50-50 Show. How fun to see everything all hung up! There is some amazing work there, and it's fascinating to see all the different styles and the way that everyone interpreted the project. And it just makes me grin like an idiot to see my art in a gallery! Woo hoo! It was crazy crowded. I had no idea it would be so crowded, and they say Saturday will be even more so. Seriously, elbow to elbow. I mostly felt like I was in the way. I would love to be out of the way but still present (like at an art show where I'm in the booth) so I could talk to people but I felt like I was constantly in the way or blocking someone, so I may not spend long there on Saturday, it didn't seem to work well for that. 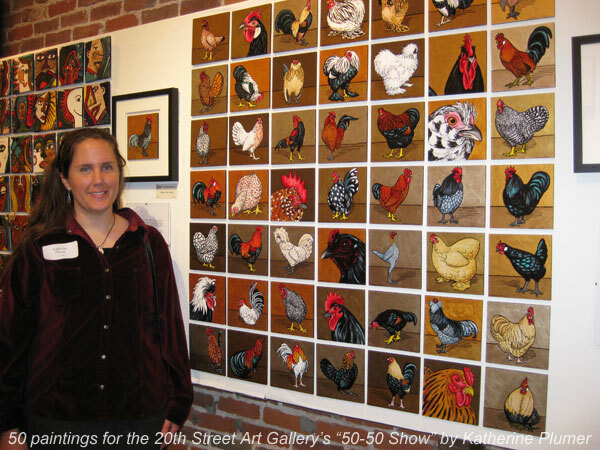 The show is open through May 30, I hope lots of you blog-readers get a chance to go see it. Remember, you can buy work over the phone from the gallery! You can see pics of all my work on my website, and just give the # of the painting to the gallery and they'll make it happen for you. 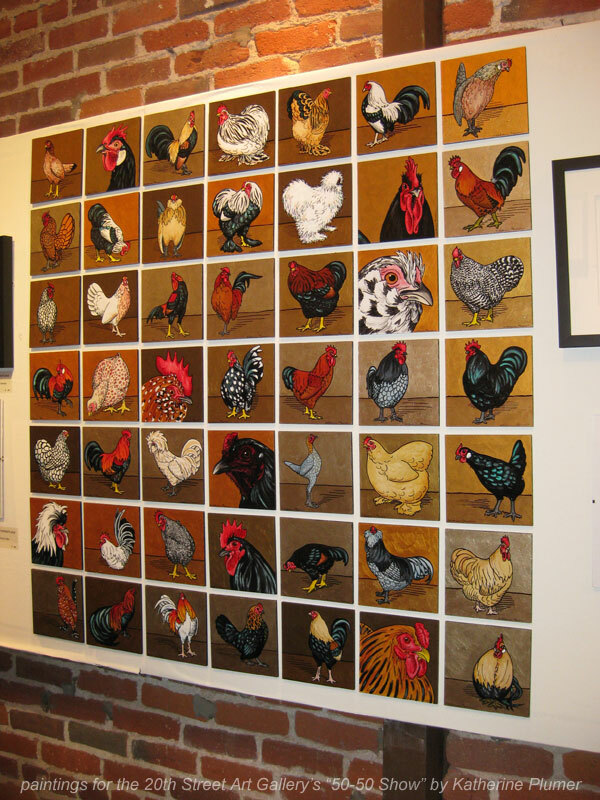 :-) Come on, everyone needs some chicken art. Looks great in the kitchen, or anywhere! They're little, 6 by 6 inches each, very easy to find a space for them. AND the gallery does a great job of framing if you'd like! (See pic below, the Andalusian rooster by my head is framed). Thank you to AC for going to the reception with me last night (and for the yummy dessert). :-) And a big thank you to the five of you who came to visit me! OMG, I am grinning ear to ear about you being in a gallery, and I am not even there!